Photograph of Paul Smith's Hotel from Lower St. Regis Lake. The Boat House and Main Building are visible. 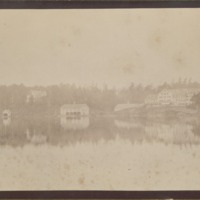 “View of Paul Smith's Hotel from Lower St. Regis Lake,” Paul Smith's College Historical Photographs, accessed April 22, 2019, http://archivesphotos.paulsmiths.edu/items/show/2133.